SEOUL - In her slim-fitting trouser suits and black-heeled shoes, Kim Yo Jong cuts a contrasting figure to her pudgy older brother, North Korean leader Kim Jong Un. On Thursday, state media said the younger Kim, 27, had taken a senior position in the ruling Workers' Party, confirming speculation she had moved closer to the center of power in the secretive state. Kim Yo Jong's title supports earlier reports from a North Korean defector group which said she may have taken a high-level role when Kim Jong Un recently disappeared from public view for more than a month, prompting speculation about his grip on power. 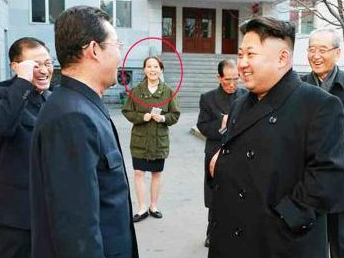 Kim Yo Jong has featured in state propaganda since her brother took over the nuclear-capable country upon the death of their father, Kim Jong Il, in late 2011. In 2012, as state TV showed Kim Jong Un arriving at the opening of an amusement park in Pyongyang, Kim Yo Jong ran from one position to another between ranks of applauding party cadres and generals as if she was orchestrating the event for the new North Korean dictator. For Kim Yo Jong, it is her family name and proximity to Kim Jong Un that supersedes any cultural norms. When Kim Jong Il ruled North Korea, his sister Kim Kyong Hui took a powerful role as a personal assistant with high-ranking military and party jobs. Writing in his 2003 memoir about his 13 years as Kim Jong Il's sushi chef, Kenji Fujimoto said the late dictator had a trusting relationship with Ko Yong Hui, his fourth partner, with whom he had three children: Kim Jong Un, Kim Yo Jong, and their elder brother Kim Jong Chol. Even at dinner, Fujimoto said, Kim Jong Il kept his eldest son at arm's length, preferring to place future leader Kim Jong Un and his sister, beside himself and their mother whom he called 'madam'.